I will be on Bryan Crump’s show again this week (Radio New Zealand Nights, 8.42pm Thursday June 3rd). Bryan wants to talk about how quantum mechanics underpins modern technology. If quantum mechanics exists in the public consciousness at all, it is through some of its spookier concepts like SchrÃ¶dinger’s cat, wave-particle duality or Heisenberg’s uncertainty principle. While these ideas are important in quantum mechanics, at least in the present day, few technologies directly exploit these more exotic phenomena. Today, rather, it is the ’quantum’ that we make most use of in modern electronics through a device called a transistor. You probably own billions of transistors … but do you know what they do or how they do it? Transistors are basically an electrically operated switch that can be used either to perform logical operations or to amplify signals. Logic is very important for any sort of computing, whereas amplification is a vital part of any communications technology. Who put the quantum in quantum mechanics? In fact, it was German physicist Max Planck’s suggestion that light came in discrete chunks, known as quanta, that set physicists on the path to quantum mechanics and transistors. Planck himself was deeply sceptical about his idea (scientists are a cautious bunch), and at least initially, seems to have regarded it as a mathematical ’trick’ to model the data on the frequencies of light produced by electric light bulbs. A few years later however, Albert Einstein used Planck’s idea to explain something called the photoelectric effect. This effect occurs when light of high enough frequency (i.e. blue rather than red) is shone on a metal, causing electrons to be spat out. What is puzzling is why it is the frequency of light that controls this process, rather than its intensity: a dim blue light will do it, but not a bright red light. Einstein was able to neatly explain this, using Planck’s ’trick’ of modelling light as quanta that have energies that are multiples of its frequency. Blue light has a higher frequency than red light, so according to Planck, blue light should consist of quanta with higher energy than the quanta in red light. Einstein realised that if a minimum amount of energy is needed to knock an electron out of a metal, then a red light, which consists of light quanta each having an energy that is too low to eject an electron, will have no effect. Increasing the intensity of the red light, which just means increasing the number of quanta, will still have no effect, even though there is apparently more energy being shone on the metal. In contrast, a dim blue light will trigger the effect, because although there are fewer quanta, each individual blue light quanta still has the energy to eject an electron. Now that Planck’s idea of quanta had been shown to explain two independent phenomena, it had to be more than just a mathematical ’trick’. Quantum mechanics was born. In quantum mechanics, all things come in quanta, e.g. photons. This applies to particles as well as light. Atoms consist of a positively charged nucleus and negatively charged electrons. The reason that electrons orbit the nucleus is that the laws of quantum mechanics allow them only to have certain energies, i.e. electrons can only occupy certain discrete energy levels in atoms. However, one of the things that makes electrons different to photons is that an electron ’fills up’ its energy level: once an electron occupies an energy level, no other electron can join it (there is a subtlety here that I won’t go into, as electrons also have a property called ’spin’, and electrons of different spins can occupy the same energy level). As electrons are added to an atom, they sit in higher and higher energy levels as they pile up on top of one another. This is the picture in single atoms, but in solid materials, which consist of atoms that are bound together by chemical bonds, things are more complicated. In compounds, electrons are allowed to occupy distinct ranges of energy, i.e. there are ranges of energies that electrons can have (called energy bands), and ranges of energies electrons can’t have (called energy gaps). These energy bands will still fill up, and once full, additional electrons have to move to a higher band. Now we are in a position to understand the difference between a metal and an insulator. In a material, the highest energy band that contains electrons is called the valence band. Whether the valence band is full or not determines whether a material is a metal or an insulator. In a metal, the valence band is only partially full — when you apply a voltage across a metal, electrons can flow in the direction of the voltage because they have space in their valence band. Hence metals are said to conduct electricity. In an insulator, however, the valence band is full. For an insulator to conduct electricity, you need to apply a voltage of sufficient strength to lift an electron up out of its valence band, across the energy gap, and into the next available energy band. If the energy gap is large, you will need a very large voltage to do this. Because such materials do not conduct electricity unless very large voltages are applied, they are called insulators. Materials that have full valence bands, but which have relatively small energy gaps, are called semiconductors. Silicon is a semiconductor, for instance. Semiconductors can be turned into conductors by a process called doping. Doping a semiconductor is like adding a car pooling lane to an otherwise gridlocked motorway. Electrons from dopant atoms can move freely up and down the almost empty extra lane while the other electrons sit glumly in the traffic jam. Silicon has four electrons per atom in its valence band, but if you add a small amount of an impurity atom that contributes only three electrons to the valence band (e.g. boron), then you create ’holes’ in the valence band that allow silicon to conduct. 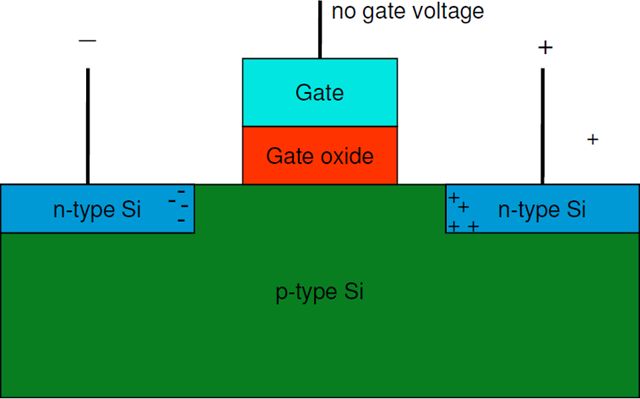 Silicon that has been doped so that it has holes in its valence band is called a p-type semiconductor (it is called p-type because, with a bit of mental gymnastics, you can think of these ’holes’ in the valence band as positive charges that carry electricity). On the other hand, n-type semiconductors (n for negative) have been doped with atoms that have extra electrons (e.g. phosphorus will contribute 5 valence electrons to silicon). These extra electrons can’t sit in the full valence band, so they sit in the next highest energy band. As this new band is only partially occupied, the electrons that sit in it can conduct. Forty years after Planck introduced his idea of quanta, three researchers at Bell Labs in the USA built the first transistor. The first step in making a transistor is to construct what’s called an n-p-n junction. That is, take a wire of n-type semiconductor, chop out a piece and replace it with a chunk of p-type semiconductor. Can this new wire conduct? No, not very well. If a voltage is applied, the electrons in the n-type part of the wire will drop into the holes in the p-type part of the wire, filling the valence band once more. Then, if they can make it once more to the n-type part of the wire, they have to have enough energy to jump back up over the energy gap. Once you have a n-p-n junction, you need to add what is called a gate. The gate is the ’switch’ which sits over the p-type part of the junction. However, it is insulated from the junction so that current can’t flow from the gate into the wire. Nonetheless, if you apply a voltage to the gate, electrons in the p-type part of the junction become polarised and build up near the gate. This fills the valence band with electrons near the gate, and suddenly current can flow through the energy band above the valence band. When the gate is off, the junction reverts to its original state and current is not able to flow. Thus the transistor acts as an electrically activated switch. When a gate voltage is applied, current can flow; when no gate voltage is applied, current can’t flow. The transistor can be used to amplify signals: a weak signal, if applied to the gate, can modulate a stronger current passing through the transistor by switching it on and off . Logic operations can also be performed: if you allow transistor A to provide the gate signal for transistor B, then you can make a circuit that allows a current to flow if transistor A or transistor B is on, for instance. Today, while it is impossible to imagine a modern world without transistors, it’s worth remembering that Planck just set out to build a better light bulb!